Yesterday marked the last day of life for my childhood pets. My parents called yesterday to say they had to put our 17 year-old cat, Shadow, to sleep. I know she is in a better place and not in pain, but it's still sad. Shadow was the baby of my other kitty Midnight, who passed earlier this year. Midnight was all black with a white star on her chest and half moon on her tummy. Shadow was the exact same-hence her name the shadow of her mother. She was born under my bed, and I would love love love taking care of my kittens when I would come home from school everyday. 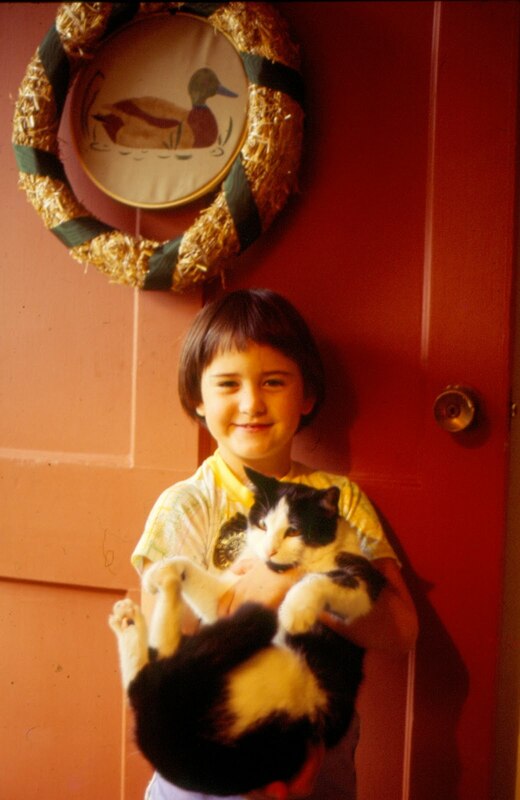 Crystal was the cat who ruled the roost. She moved with us for IL to FL when I was 8-she was my favorite kitty cat, but passed two days before I came home for the summer after my freshman year of college. Here's a pic of me and Crystal back in the '90's. 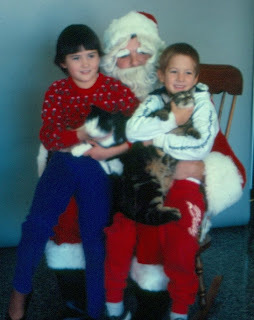 Crystal and Marshmallow posing for the most horrendous Santa picture on the face of the planet﻿. Marshmallow was also a Yankee transplant with Crystal. She got her name because she was white with a little black-just like a burnt marshmallow. I remember I wrote a paper in second maybe third grade about my two best friends Crystal and Marsha (I gave her a people name for my paper)-ha! Now that I think of it I wrote a bunch of papers about kitty cats. In second grade I won an award for a paper I wrote about a kitty cat chasing a ball of yarn, when I went to get my certificate I shook the principals hand with left instead of the right, and then I got the important life lesson from my parents on how to properly shake someones hand. Then there was Q-Tip, my very first kitty. She was an orange cat with a white tip at the end of her tail, just like a Q-Tip. Gosh I was good at naming cats! I can't forget our doggies, there was my beloved beagle, Peaches. We got her the summer before I started 10th grade. She was our family dog, and we loved her, she loved us, too. Especially my mom, she would follow her around everywhere. 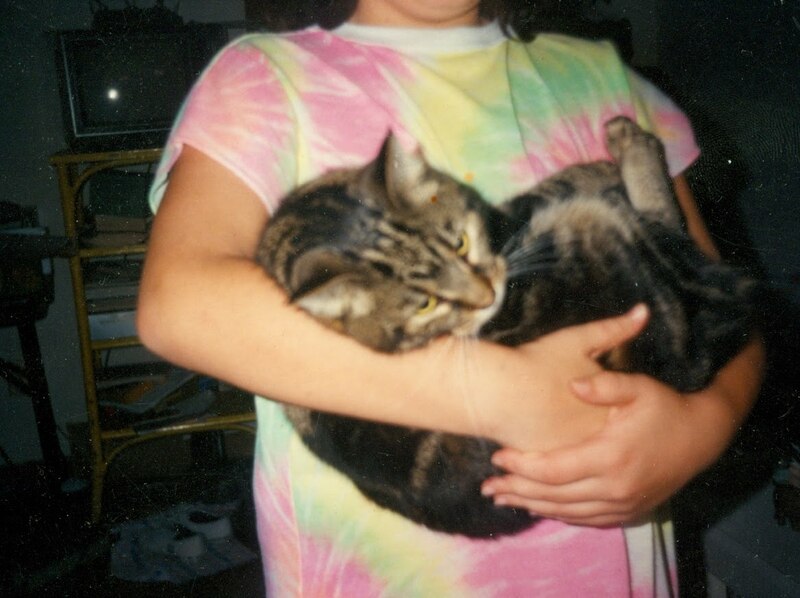 Peaches got a little plump in her later years, and did not like being put on a diet by my parents. She also LOVED to chase Shadow and Marshmallow around the house! 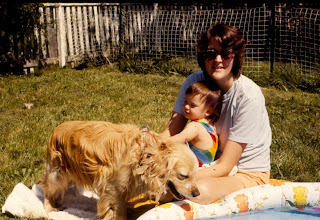 And Josh was my parents dog before I was even born. Funny that my parents had a dog that shares the same name as my husband. Josh, the golden cocker spaniel, liked to run away - a lot, actually so did Peaches in her younger years. I am so sorry! Losing pets is just heartbreaking! My family's cat, Saydee, was put to sleep nearly two years ago and my parents still choke up talking about her! Crystal + Marshmellow sure were lucky to land in such a sweet home! I'm soooo sorry -- it's so hard to lose our pets and they take a piece of our heart with them when they go. I am so sorry about the loss of shadow.